Imagine soaking in your own private pool and hot tub, or enjoying a short walk to the public beach access on your next Outer Banks escape. These dreamy vacation memories are readily waiting at Starry Nights, a sweetly appointed 4 bedroom vacation home with a stellar locale in the heart of Kill Devil Hills. Close to area attractions, shops, and restaurants, and offering a world of entertainment at home, vacation dreams truly come true at this nicely outfitted home. The interior of Starry Nights is just as delightful as those evening views from the two levels of decks. The entry level features a recreation room with foosball table, mini fridge, TV, stereo, double sleeper sofa and convenient half bath, while the second level boasts three quietly inviting bedrooms, including a master with queen bed and a neighboring deck overlooking the pool. Upstairs, the family can regroup and relax in the spacious great room with a dining area for 6, a living area with TV, DVD, and DVD Library, and an adjacent slider that leads to a gracious deck with ocean views. A master bedroom with king bed is also found nearby, and the entire home is outfitted with lovely touches of coastal colors and pops of decor. From the private pool and decadent hot tub to the fine locale in the heart of everything, Starry Nights is one sweet retreat. 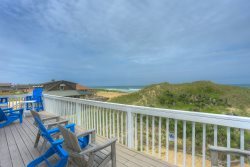 Make your escape to pure vacation bliss, and reserve this Kill Devil Hills vacation rental today! Top-Level: Master Bedroom with King, TV, DVD; Kitchen with 4 Barstools, Dining Area seats 6; Living Room with TV, DVD, DVD Library, Half Bath, Slider to deck with Ocean Views. Mid-Level: Queen Bedroom with TV, DVD; Bunk Bedroom with TV,DVD; Hall Bath; Master with Queen Bed, TV,DVD; Washer/Dryer; Slider to deck overlooking pool. Ground-Level: Recreation Room with Foosball Table, Mini Fridge, TV, Double Sleep Sofa, Stereo, Half Bath. Starry Nights was perfect! Close to beach and house had everything we needed.